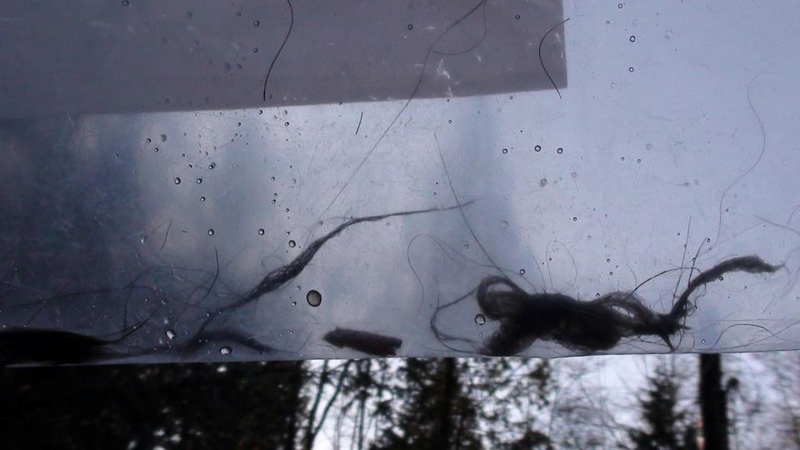 Randy Brisson has submitted many hair samples for analysis and now has recovered some more sasquatch hair. "And some say there is no Sasquatch Hair, Well I saw the Sasquatch leave this Hair on a branch, Proof is in the Bag." Some people call Randy a hoaxer but there is no proof of that and he is in a great place for sasquatch, Randy is in Vancouver, British Columbia and he and his family routinely go out and search for sasquatch. It is also reported that he has a few samples in to the Dr. Ketchum DNA study. 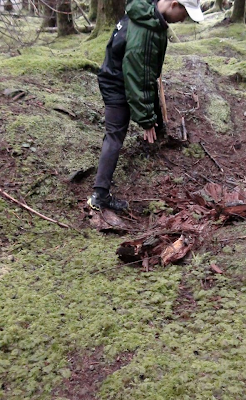 Randy and his son Ray go out in the woods often and look for evidence of sasquatch. 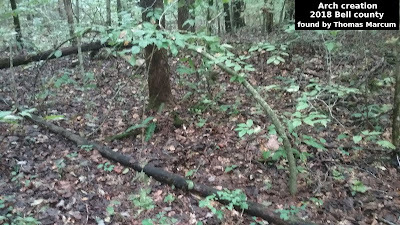 In the above photo you see Ray checking out a recently found track way.Ray was checking out the Distance between the tracks in the photo. According to Randy they followed this trackway for about 30 minutes and it end at a cliff. "The tracks were big tracks about 17 inches" Randy posted. Randy Brisson is one of our favorite researchers and I enjoy his fines and pictures. Glad we are able to give this recent update on his research. Nice to see someone reporting on this guys work. Thanks Tom. I get sick and tired of all the hear-say BS that goes around the bigfoot world regarding certain researchers. Thanks for your fair and honest reporting. Keep up the good work Randy! We live in a beautiful part of the world, and I am looking forward to getting out myself this spring and summer in Golden Ears! Feel free to get in touch with me. Thanks Beer-Man...sometimes I get full of some of these folks in the bf community..they are all so defensive..then some see bigfoot in every shadow and if you say "I think that's just a shadow" ..they get mad at you...gee whiz. His is one of the few researcher channels I subscribe. For one, he films and uploads in HD. Even if he finds little or nothing, seeing the beautiful forest is reward unto itself. As an interested outsider, it seems if you are a researcher who finds something you are a "hoaxer" and if you are a researcher who has not you are just "nuts". It's difficult to take seriously a community so into self-destruction. But there are diamonds in the rough, like this site. Keep fighting the good fight. Hi, He does not have any Youtube, or other Channels, Just Facebook, Thanks, Ray. I think in the other comment he was talking about follow our youtube channel. I think.